Aero Simulation, Inc. (ASI), of Tampa Florida was awarded the primary contract for major upgrades to the CH- 53E and CH-46E Aircrew Procedures Trainers by the Naval Air Warfare Center Training Systems Division (NAWCTSD) in Orlando. As part of this effort, VDC will provide to ASI the High Resolution Visual Display Systems (HRVDS), consisting of four Marquee 8500 LC Ultra Projection Systems, HD-117 lenses, 3D Perception Edge Blending and ACON auto alignment systems. The HRVDS will be integrated with a Multi-Channel Visual System IG and Visual Environment, a Host Computational System and other elements of the CH-53E/CH-46E APTs (Devices 2F171 and 2F172). The upgrades will be installed at the Marine Corps Air Station (MCAS) Futenma, Okinawa, Japan in 2008 and 2009. 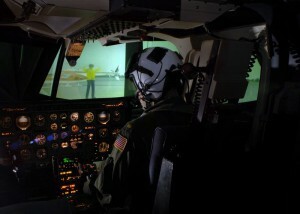 The Upgraded Visual Systems, when integrated with Government furnished and ASI-supplied equipment, will be capable of simulating real-world, Out-the-Window (OTW), Night Vision Goggles (NVG) and Forward Looking Infrared (FLIR) scenes during ground handling, takeoff, and landing of the CH-53E/CH-46E aircraft, as used by military aircrews in executing mission procedures in a tactical environment under normal and degraded or malfunctioned conditions. Video Display Corporation designs, develops and manufactures unique solutions for display requirements for military, medical and industrial uses with emphasis on high-end training and simulation applications. Its product offerings include ruggedized LCOS, CRT and AMLCD displays as well as complete projection display systems utilizing VDC Display Systems Marquee(TM) and ESCP line of projectors. VDCDS has extensive experience delivering projection systems worldwide used in many commercial and military trainers, as well as complete solutions for a broad range of applications. Video Display Corporation operates eight sales, design and manufacturing facilities throughout the United States and Europe. For more information, visit the Company’s web site at www.videodisplay.com.